About the author: Angelina Kreger is a veteran high school history teacher and instructional coach in Novi, MI. She has five years’ experience teaching the semester-long BHP course to twelfth graders. “Today, we’re going to explore ‘Life and Purpose,’” begins the enthusiastic teacher. The students look up hopefully. “It’s an article in Unit 5 we’ll study using a Three Close Reads activity.” A unanimous groan—they’ve realized she means reading. Have you had this experience? Do you sometimes wish you could get around the Three Close Reads activities? They’re not always the most fun-filled exercises, compared to everything else the Big History Project offers. But reading—in any history classroom—is an integral part of learning the content and making sense of larger historical patterns, and Three Close Reads is one of the best research-based strategies to accomplish this task. That’s why, if I’m teaching students the skills of a real historian, this technique hits the mark. 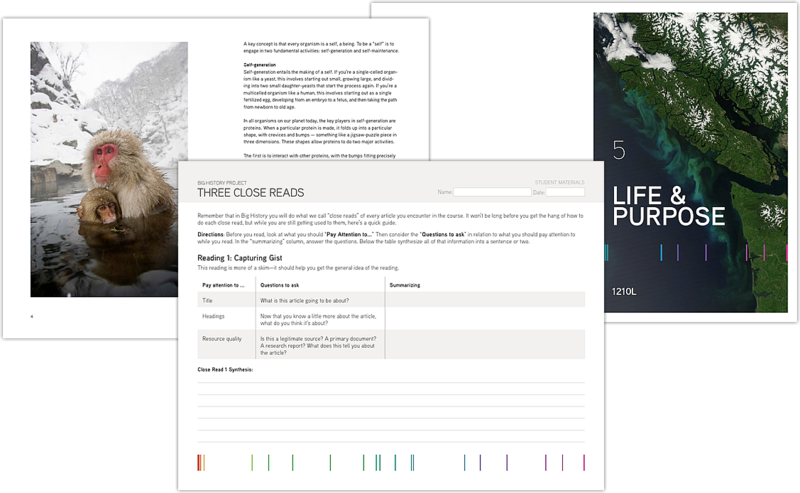 The Three Close Reads activity that accompanies every BHP reading assignment is really helpful, but it can be a bit overwhelming. There are some ways to break the work into smaller chunks for your students. In my classroom, I like to take the questions for each close read and post them on separate pieces of chart paper. After giving students the reading material, I ask them to work in teams to answer the questions, moving from station to station. Small groups can share out quickly after each stage of reading. This is a great way to introduce the activity at the beginning of the year and get students familiar with the process. I change out the pieces of chart paper as the students complete the different “reads.” As they work, I monitor for misconceptions and write formative data on the chart paper to figure out if I need to spend more time on the reading. For the first read (capturing gist—the preview read), pair up students and have each skim the text. Make one student the “questioner” and the other the “responder.” Provide the questioner with the questions for the first of the close reads, found in the lesson. The responder uses their reading to help them answer, and the questioner allocates points for every correct response given. Both students move on to the second read (informational—reading for facts and key ideas) and read the text for understanding; then they switch roles. For the third reading (thinking bigger/conceptual thinking), students might work independently or the groups might reverse roles again. Critical reading is not a gift or a talent – it’s a skill to be learned. As students engage with text that is often filled with discipline-specific vocabulary and content, it’s our job to provide them an on-ramp that makes the text accessible and offers opportunities to internalize their learning. Three Close Reads does this explicitly. You’ll see students who can take the skills presented and transfer them to any course or content. Sure, many lessons will start with that collective groan, but there are plenty of strategies to make sure these same lessons end in critical thought and a feeling of intellectual success.